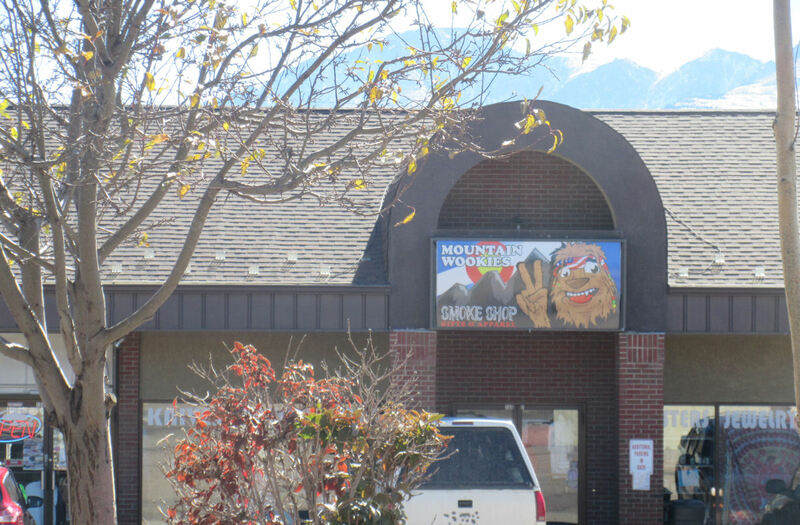 The Springs in Fall…2015 Photos #8: Munchies in the Mountains « Midlife Crisis Crossover! This is not the Star Wars toy store you’re looking for. By the time I left the Cave of the Winds, it was after 12 and lunch sounded like a great idea. 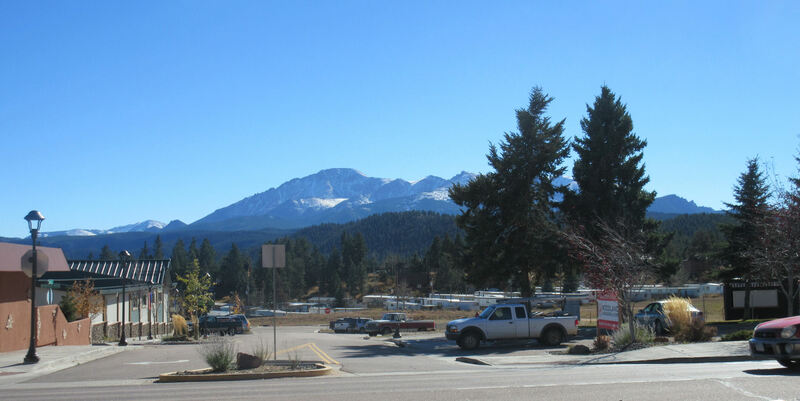 My original plan had been to work my way up US 24 into the Rocky Mountains for a while, eventually switch to another winding highway, and browse the restaurant and sightseeing options in the town of Cripple Creek. 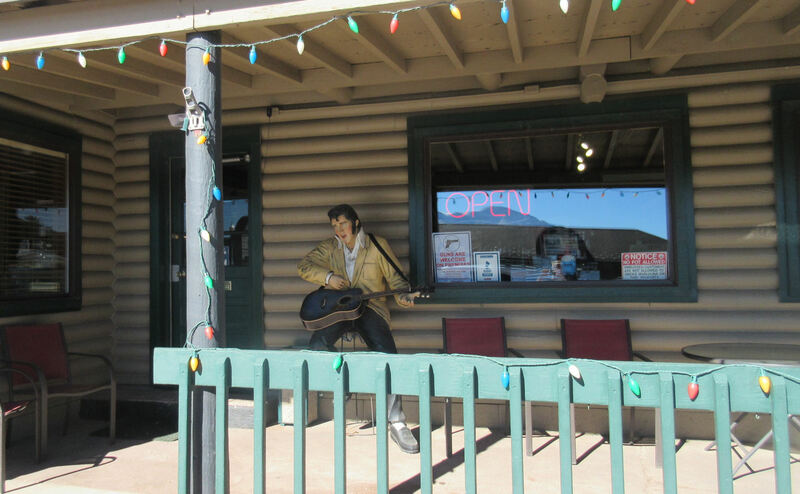 All the brochure photos looked like Deadwood or other Old-West throwbacks filled with arts, crafts, state-themed souvenirs, cheesy knickknacks, period boutiques, and probably casinos in every other storefront. Plenty of opportunities for bemusement and/or learning experiences, maybe. Woodland Park has more than a few strip malls, but it took me several minutes of searching to find public parking that would allow me to drop off the car and wander around at will. 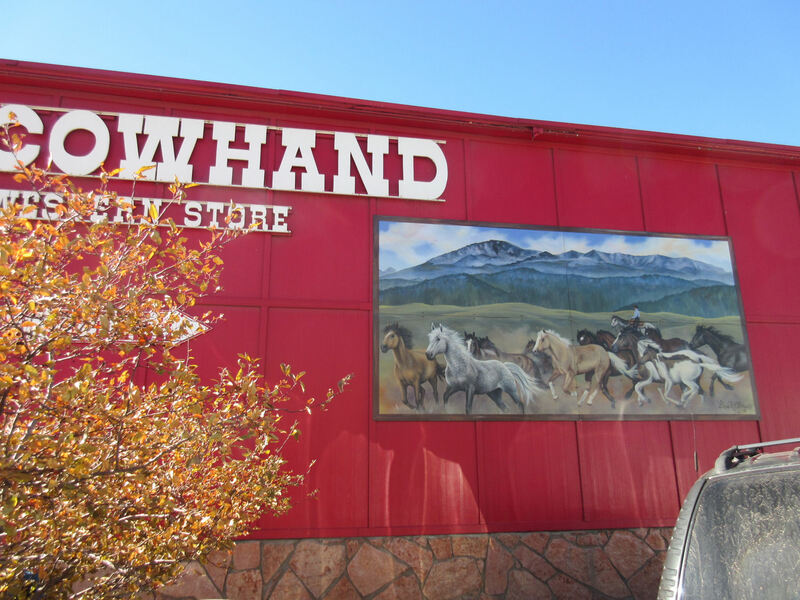 I settled on a small lot behind a Western-wear store with a wild-horse painting on the side. I declined to look inside. I’m not one for boots, cowboy hats, belt buckles, leather, or country-rock club-wear in general. 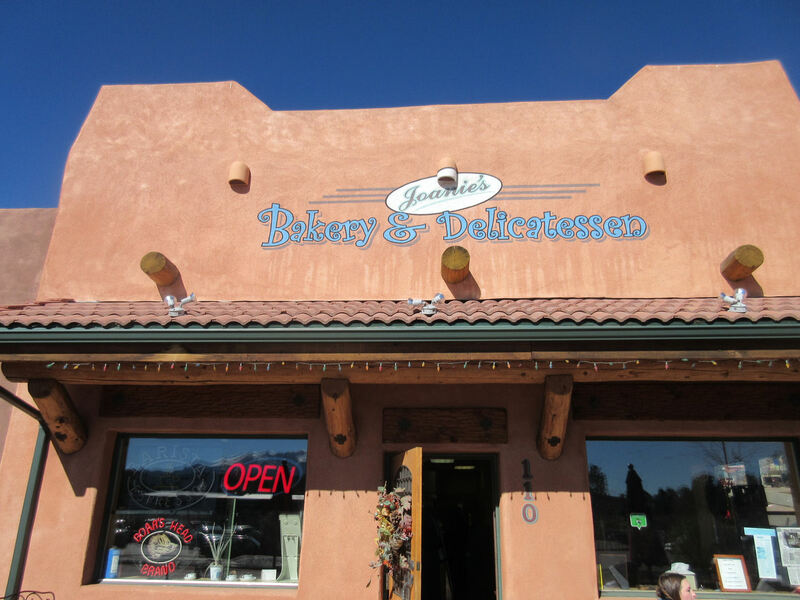 My first choice for lunch was this bakery and deli, based solely on the character of their exterior. Inside the front door, the menu read like standard deli fare, but there seemed to be communication issues between the cashier and her ordering customers. After a few impeded and repetitive exchanges, I slowly backed out the door with only this photo to remind me those two minutes ever happened. Woodland Park has their share of standard fast-food joints, pharmacies, and so on. A few businesses here and there aim to provide a different visual experience for visitors pinning high hopes on all of Colorado. 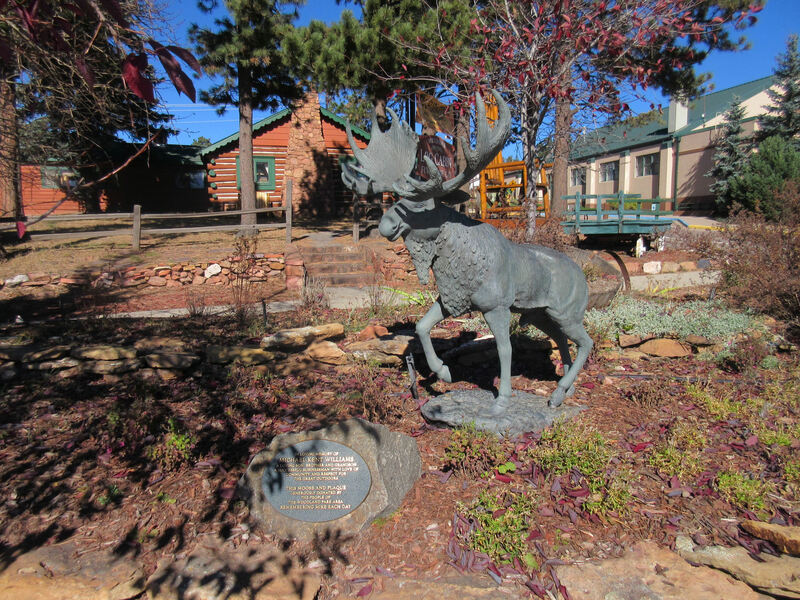 This moose stands before a plaque that hints at a long story but refrains from telling it. When Anne and I drove around Colorado on Day 1, among the many things we noticed were the handful of marijuana dispensaries that dotted the commercial landscape, including but not limited to the creative establishment in our lead photo that I presume remains well below the super-powered Lucasfilm radar. Maybe Colorado society and culture have changed drastically since they legalized it, but I couldn’t tell you how. In this six-day stretch I only noticed the smell of it on anyone once. I can’t begin to tell you the number of ways in which recreational drugs have never been my thing, so there’s not much else to add to the end of this paragraph. 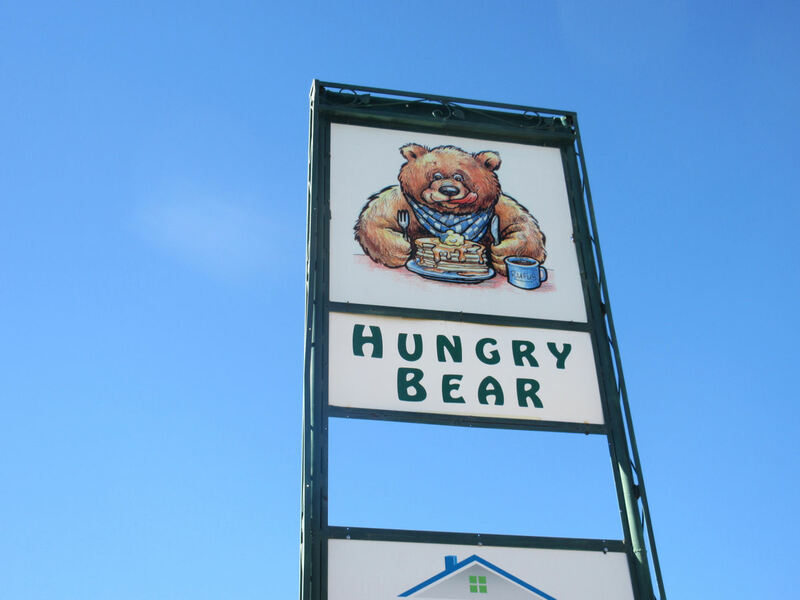 But I do wonder if a lot of their customers later make their way to restaurants with names like the Hungry Bear. With a sign like that, of course it was my next stop. 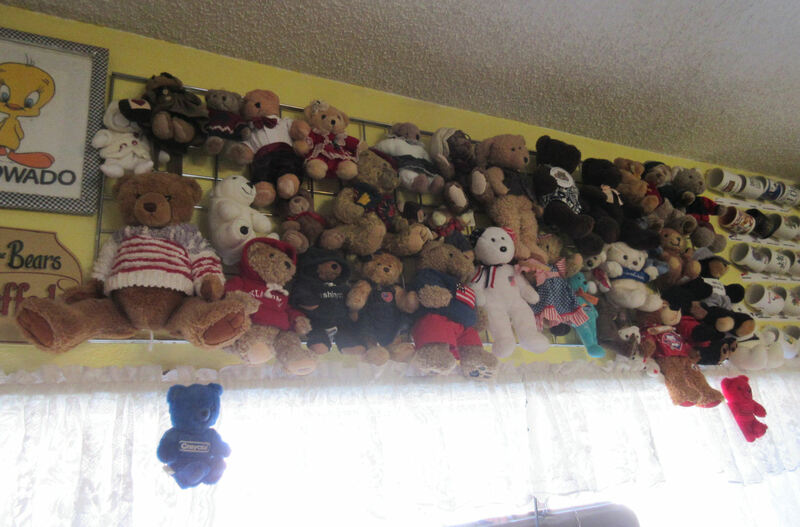 I look forward to your essays about this travelogue series in which the recurring bear motif is explored at length. Why did bears follow me wherever I went? Was it coincidence or an unconscious yearning on my part? What part of my childhood does the bear symbolize? And so on. Inside it’s standard diner fare, plus the front section has bears all over it. I’m pretty sure they were for sale, but I didn’t ask for prices or free samples. They’re like a Greek chorus looming above and calling to me, cautioning me to heed the bear as my spirit animal. Or something. Full immersion in this rustic setting moved me to choose a fitting meal option: a hearty round of breakfast for lunch. 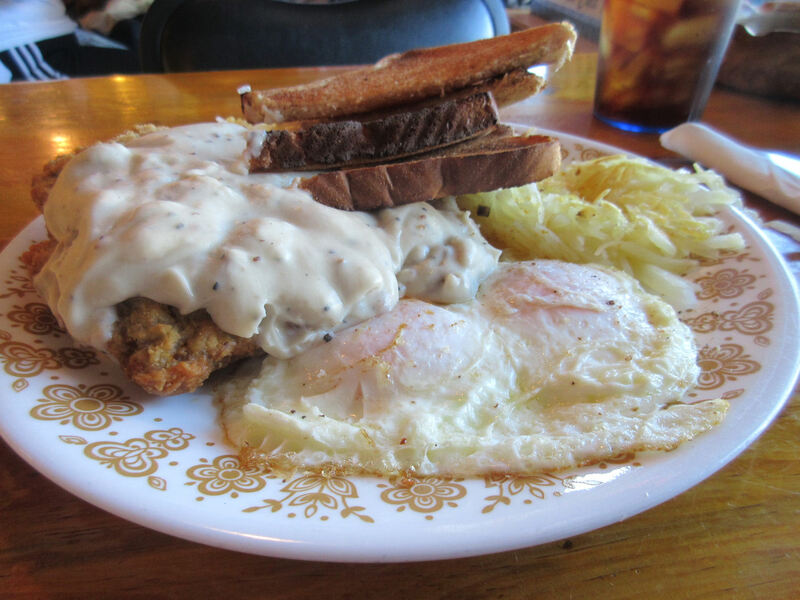 Hence country-fried steak and eggs, which I hadn’t had in years. I kept to myself while I rested and ate and kept out of the way of the largely blue-collar crowd, though it was hard not to be distracted by a trio in a far corner having a lively discussion about the films of David Lynch. Not something you’d expect to encounter in a place that’s probably home to an above-average number of grizzled prospectors per capita. Because not every indulgence has to be exotic foodie fare selected for its photogenic properties. Sometimes it’s okay to let protein be protein. 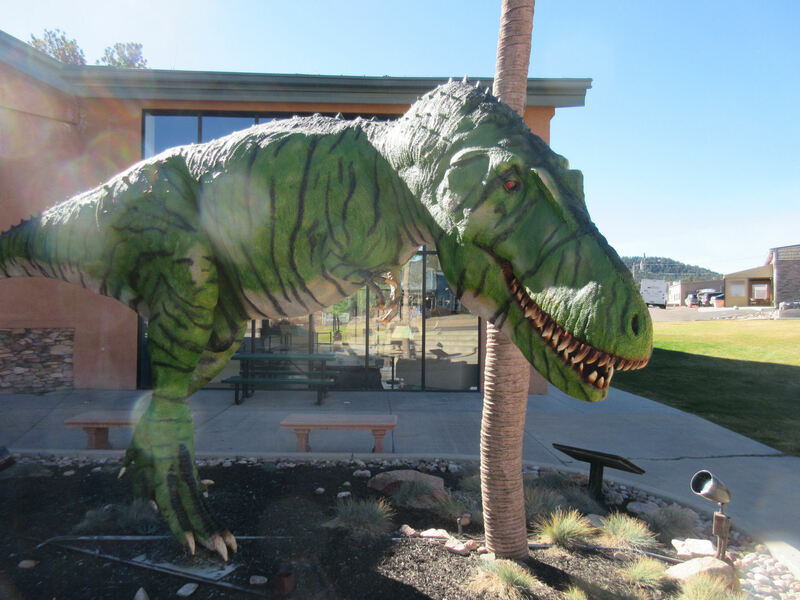 After my feast, I walked around a tad more and made one additional stop, at a museum called the Rocky Mountain Dinosaur Resource Center. In a world where Jurassic World can become a colossal hit, a proliferation of dinosaur educational hubs is to be expected. 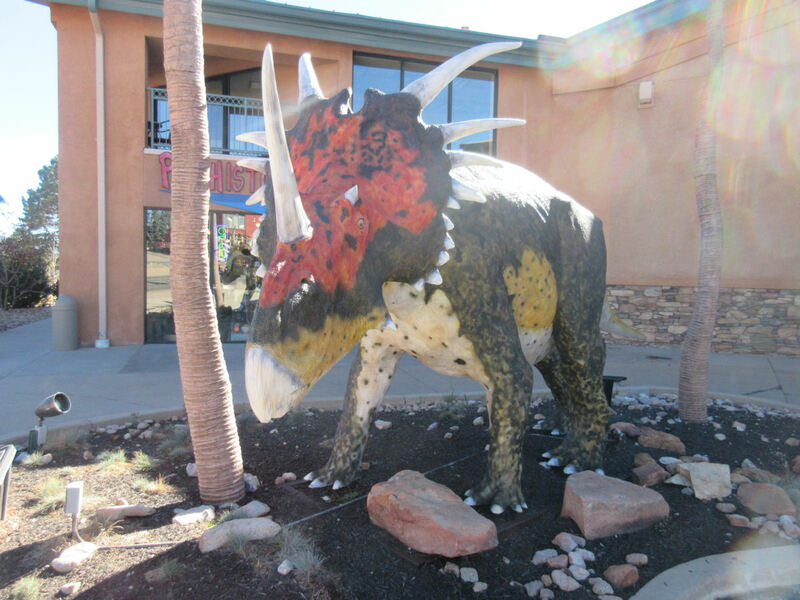 Bonus points for going with the uncommon styracosaurus over the populist triceratops. That’s extra dino-cred right there. The Center had two dinosaur models outside and probably another army’s worth inside. I wouldn’t know because I’ve seen natural history museums in so many shapes and Yelp-rating levels that we stopped touring them when my son stopped traveling with us. But this one was on my to-do list for one quick objective. If your dino-based business has no life-size T-Rex in its collection, I don’t even know how you’d have the nerve to call yourself a legit dinosaur fan. I stepped inside the front door, was shocked to find their smashed-penny machine sitting there like a happy greeter, pressed a souvenir for my wife’s collection, and retreated with another MacGuffin to hand over later after her shift ended. Meanwhile in the ticketed-admission part of the museum, I imagine a clerk or two stared at my quick pay-‘n’-smash and declared me a weirdo.